Candied bacon may sound wrong, but it's oh so right! To make this easy recipe, all you need to do is coat bacon with a sugar and spice mixture and bake it until it's crispy. The resulting treat is simultaneously chewy and crunchy, sweet and salty, and completely addicting. Not sure how you should enjoy Candied Bacon? First off, it's wonderful eaten plain. But you can also crumble it on salads, use it on sandwiches, or crush it up and use it to top cakes, cupcakes, or doughnuts! You can also dip it in chocolate....yum. Preheat your oven to 350 degrees F (176 C). Prepare a baking sheet by lining it with aluminum foil, then place an oven-safe wire rack on top of the pan. Spray the rack liberally with nonstick cooking spray. In a bowl, combine the brown sugar, the cinnamon, and the cayenne pepper (if using). Toss them together until the spices are well-distributed. Take a strip of bacon and press it into the sugar mixture, then turn it over and coat the other side with sugar. Place it on the wire rack, then repeat until all of the slices of bacon are covered with sugar on both sides. If you have any remaining sugar, sprinkle it over the top of the bacon. 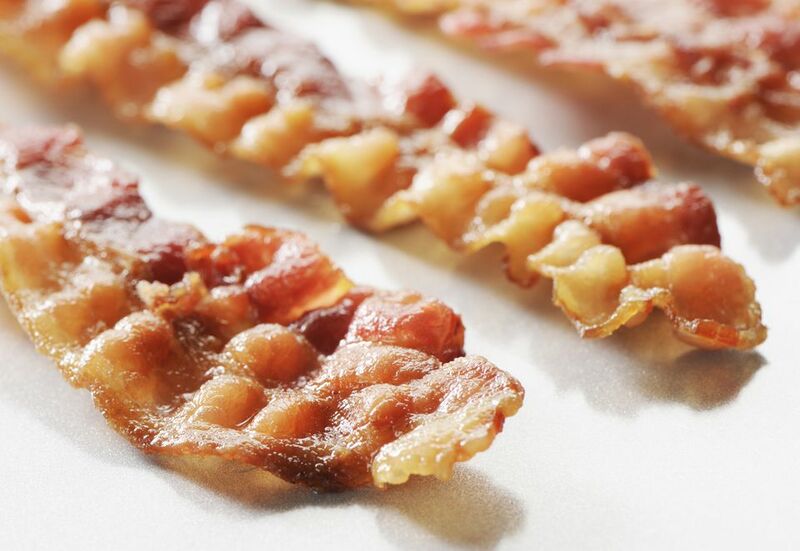 ​Bake the bacon in your preheated oven for 20-30 minutes. When it is done, it will be firm and crispy and dark along the edges. Soon after you take it out of the oven, use a spatula to lift the bacon off the rack—sometimes the sugar and fat cause the bacon to stick, and if it's not removed when it is still warm, it's difficult to get off of the rack. Let the bacon cool completely, and then enjoy! Candied bacon can be eaten on its own, crumbled to use as a salad topping, or enjoyed on top of other desserts like cakes or cupcakes. Click Here to View All Bacon Candy Recipes!